Every day, we help thousands of ecommerce companies deliver email to millions of recipients. SendGrid’s platform is an ideal solution for many of these companies because it can be used to send both transactional and marketing email. In addition to meeting the needs of ecommerce email senders, SendGrid is the industry leader when it comes to customer support, deliverability, and email expertise. Throughout the guide, you’ll see examples of how other ecommerce companies use SendGrid to message recipients and grow their businesses. You’ll also see how the average ecommerce company’s email needs change over time so that you can better predict future email changes. Transactional Email – Emails sent to recipients to facilitate a recipient action or transaction. Account confirmations, order receipts, password changes, and other essential emails are transactional emails that keep businesses running smoothly. Marketing Email – Commercial or promotional messages like sales announcements, newsletters, and daily deals all help advertise businesses, drive revenue, and increase brand awareness. SendGrid has always been a delivery-first ESP, we built our own custom MTA and have a team of delivery experts devoted to getting your mail delivered. We focused on our infrastructure first, which allowed us to build a reliable and scalable system that now sends over a billion transactional and marketing emails every day. eBay is where the world goes to shop, sell, and give. The ecommerce platform has 167 million active users around the globe, $8 billion in revenue, and 18,000 employees. eBay provides consumer-to-consumer and business-to-consumer sales and services via the Internet, and they send more than 1 billion emails each month with SendGrid. Since email is such a powerful driver for ecommerce, eBay committed to a differentiated experience in this channel. SendGrid has helped eBay implement a 1:1 personalization solution that uses real-time customer engagement data. This solution has transformed email marketing at eBay. Now instead of hundreds of small, uncoordinated campaigns each month, eBay has a small set of “flagship” campaigns comprising one or more real-time, personalized offers. We also learned that it doesn’t matter how great an email is if it doesn’t get delivered to the recipient correctly. As a result, we focused on providing industry-leading support as well as Expert Services to help customers get their messages delivered to the inbox. As ecommerce companies grow, the number of emails they send also scales in volume. Some of our largest customers are now sending 100s of millions of messages each month. On Black Friday of 2016, we sent 1.6 billion emails, with some of our top ecommerce email senders sending over 200M emails in a single day. The revenue return from email campaigns on days like Black Friday are a huge benefit to our ecommerce customers. In fact in 2014, a study by Custora linked email to helping create 27.3% of online sales. Delivery speed is another huge competitive differentiator for ecommerce senders. If you’re in a time crunch and your competitor makes it to the inbox faster than you do, you lose your edge. Our infrastructure and APIs allow us to process more emails per second than our competitors—up to 3,000 emails per second, so you get your mail through when you need it. We help thousands of companies deliver their email to billions of recipients. One of the best ways you can check the health of your email program is by comparing your engagement metrics to industry averages and other ecommerce senders. Use these numbers as benchmarks to compare against your program—where do you stand? If you’re beating the industry averages, we suggest you continue implementing good sending habits. You can scroll down to the Delivery Best Practices section to learn more. If your engagement metrics are well below the industry average, you may need to make some changes. In these situations, you may want to check out our 2018 Email Deliverability Guide or our 2017 Tips and Tricks to Stay Out of the Spam Folder Guide. What Does the Average Ecommerce Email Sender Look Like? 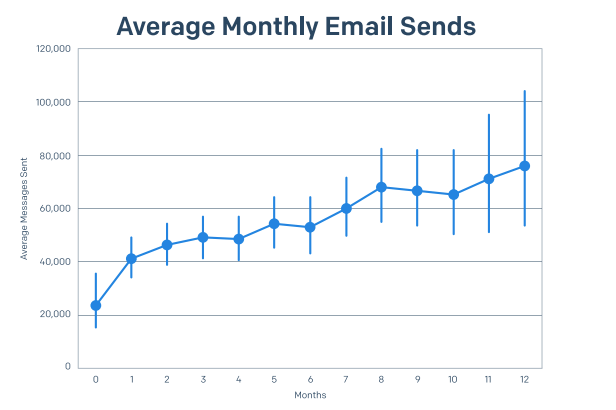 The chart above shows the average number of emails sent by the majority of ecommerce companies during their first year using SendGrid. If you’re just starting out with email, and depending on your subscriber list size, you may plan to start your program with sending about 20,000 to 40,000 emails each month. Over time, that number could grow to 80,000 to 100,000 emails each month. SendGrid is known as a reliable solution for transactional email that ecommerce companies can use to send password resets, receipts, or other messages, but more and more companies also choose to store contacts and send marketing email with SendGrid as well. The chart below shows customers who only send transactional email on the left and customers who send transactional email and have uploaded contacts into our email marketing feature set, Marketing Campaigns, on the right. The customers on the right tend to send much more email than strictly transactional customers. In addition to the total number of emails sent each month, companies should also be aware of the average number of contacts, or recipients, stored. SendGrid’s Marketing Campaigns customers store an average of 22,000 contacts that are messaged multiple times each month. If you’re unsure of how large your list will grow in the future, or how many messages you’ll be sending each month, these charts may be good benchmarks to keep in mind to help you plan ahead. 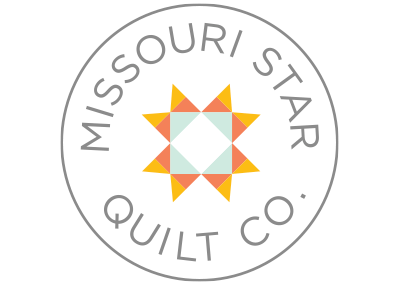 In November 2008, on a shoestring budget, the Missouri Star Quilt Company bought an old brick building in Hamilton and started their business. At first they offered basic quilting supplies and machine quilting services, but business picked up when they started posting tutorials teaching simplified quilting techniques online. To their surprise, Missouri Star became the biggest quilting channel on YouTube! Now they offer the largest selection of precut fabrics in the world. What started out as a family business has grown to include an entire community. In addition to receipts, account updates, and other transactional emails, the company sends their contacts marketing emails like daily deals and newsletters. Today, the company sends more than 10 million messages each month to over 450,000 users. Many email marketers in the ecommerce industry are often focused on small wins they can implement to increase clicks or opens on individual sends. Increasing engagement when possible is always great, but you also want to make sure emails are arriving in the right place and getting your message in front of as many people as possible. One of the things that we saw in our 2017 Global Email Benchmark Report is that senders who send a high number of emails to individual recipients each month are sacrificing engagement. 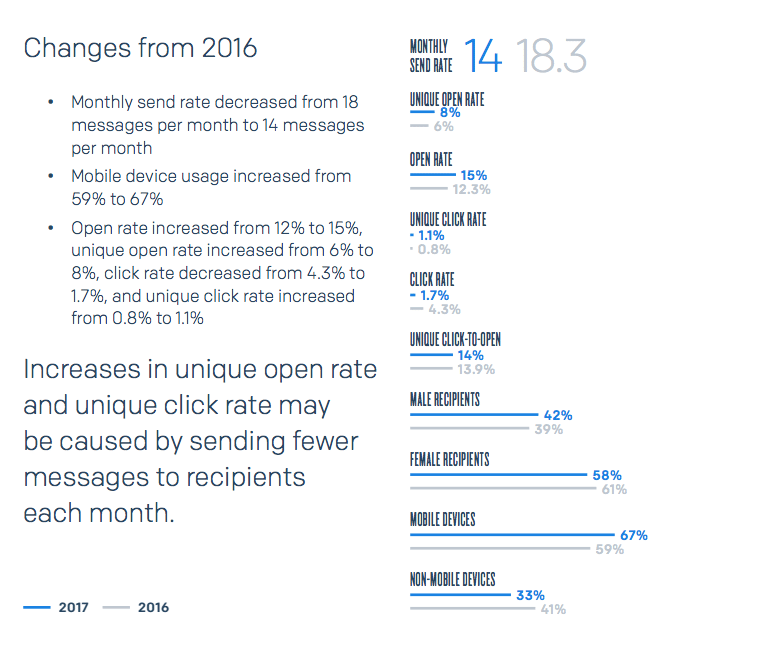 In 2017, the ecommerce industry saw a decrease in average monthly send rate from 18.3 messages sent to individual recipients each month, down to 14. As a result, they also saw an increase in engagement metrics. Individual senders may consider lowering their monthly send rate if they’re higher than the industry average to improve their email engagement. To learn more about how email engagement has changed across all industries, you can download the 2018 Global Email Benchmark Report. Smaller ecommerce senders who send fewer than 30,000 or 40,000 emails each month may be fine sending email from a shared IP, but larger senders need to be more strategic. As you scale your email to 50,000 messages per month and beyond, thoughtful segmentation needs to be implemented. Send transactional email and marketing from separate IPs. If your volume is really taking off, you may consider sending different types of marketing email (re-engagement messages vs. monthly newsletters) from different IPs as well. You may also want to schedule time with our Expert Services Team to get a personalized sending plan in place and optimize your program. TestingMom.com is an online educational resource that provides test-preparation and skill-building for pre-kindergarten through 8th grade students to help parents and students navigate and prepare for scholastic testing at an affordable price. By using the contact segmentation tools within SendGrid’s Marketing Campaigns, TestingMom.com imports data taken from customers at sign-up to create highly-targeted, dynamic recipient list segments. Once a targeted segment has been created, subscribers can then opt-in to receive various email content at key points throughout the day, like mornings, after school, before bed, etc. By combining their dynamic segments with subscriber email preferences, TestingMom.com delivers their content when it matters most. Not only is buying contact lists against SendGrid terms of service, it’s a proven way to negatively impact your ability to get messages delivered to the inbox and not the junk/spam folder. The fact is, if you buy a list and begin sending email to those contacts, they aren’t going to know who you are or what your business is, and they going to be a lot more likely to mark your email as spam. For more tips on growing your recipient list the right way, visit our interactive How to Grow Your Email Marketing List Guide. One of the things great ecommerce companies do is send a confirmation email to people that have provided them their email address. This allows the company to provide the new contact with more information about the types of messages they’ll receive. It also provides a way for them to re-confirm that the person wants their email in the future, making them a lot more likely to engage with future sends. Whether you do it at the point of address collection, or you include some frequency information in your confirmation email, letting people know how often you’ll be messaging them is a great idea. When recipients can anticipate your messages, they’ll be likely to open them and click the links within. A preference center allows recipients to choose which emails they prefer to receive. While this may seem like a way for people to limit the ways you can message them, they’re really raising their hands and telling you exactly what types of messages they’d like receive. This means you’re likely to have interested, engaged recipients of specific messages, which is always a good thing. Two of the best ways to keep recipients engaged is by sending personalized content to specific segments of customers. By creating targeted segments of customers and leveraging custom fields, you can send intentional content that’s designed just for them. This will drive a better connection with customers, and make it more likely that they will engage with your messages. If you’re interested in learning more about personalization, see how Bounce Exchange and iBotta use content and segmentation to improve their email marketing programs. Strava is the premier social fitness app that tracks running and cycling activities so that you can track runs and bike rides, compete with friends and other users, and see what your favorite athletes are doing. Strava sends millions of messages each month, driving revenue and user engagement with thoughtful and timely messages. Learn how Strava has scaled and drives revenue through emails in their case study. When the success of your business is based on your ability to communicate with your customers, having a scalable, reliable email service provider is critical. SendGrid’s platform allows ecommerce companies to send 1-to-1 transactional emails as well as 1-to-many marketing emails.